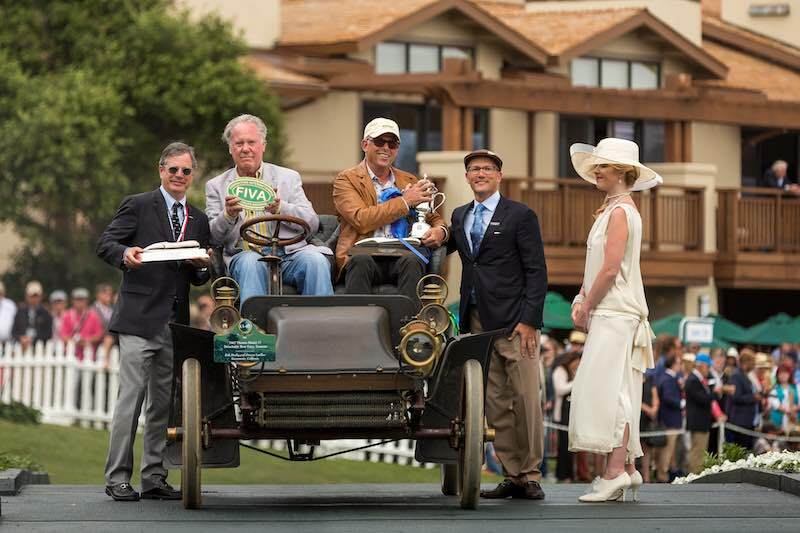 At the Pebble Beach Concours d’Elegance on Sunday 21 August 2016, FIVA (the Fédération Internationale des Véhicules Anciens) awarded its preservation trophy to the 1902 Thomas, Model No. 17, owned by Kirk Bewley of Sacramento, California and Stewart Laidlaw of Redding, Connecticut. The FIVA preservation award recognises vehicles that retain much of their original components, materials and finishes and as such are important cultural artefacts. The 2016 awards are part of the FIVA World Motoring Heritage Year celebration under the patronage of UNESCO. In 1902, E. R. Thomas Motor Company acquired the assets of the Buffalo Automobile and Auto-Bi Company and began producing the single-cylinder, 8 h.p. Thomas, Model No. 17. The following year, the company introduced the much more powerful three-cylinder 24 h.p. Model No. 18 and eventually became well known for creating durable and powerful automobiles. The company received international fame when an American team won the 1908 New York to Paris race in a 1907 Thomas Flyer. The company went on to produce automobiles until 1919. “This 1902 Thomas is believed to be the oldest complete Thomas motor car known to exist,” said co-owner Stewart Laidlaw. “Several years ago, it was purchased from the Wells Museum collection in Maine, which had owned it for more than 60 years.” While the precise history is not known, the car is thought to have resided in Maine from new, with only one owner prior to Mr Wells. Stewart Laidlaw has collected and sold early brass era cars for more than 50 years. “I have a total affection for original cars,” he said. “This car is the best original early car I’ve ever seen.” Over the last decade, Mr Laidlaw’s cars have won the pre-War preservation class at the Pebble Beach Concours d’Elegance a record five times. Co-owner Kirk Bewley is a longtime friend and both men are members of the Horseless Carriage Club of America.